As with any cottom item the life expectancy of your hammock depends on the care that is taken, not only while the hammock is in use but also when handling and storing for the winter. Follow a few basic rules and your hammock will give you many years of enjoyment. When handling the hammock, always take care to hold it by the handles to avoid tangling. 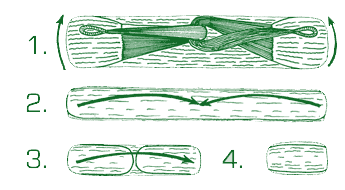 When storing your hammock it is a good idea to twist the arms together or fold using the method shown here. This will ensure that the arms to not become entangled. Remember to dry it out thoroughly and store it in a dry place as damp cotton will rot quickly. You should never hang the hammock handles directly on metal fittings. 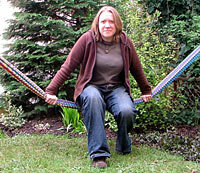 The resultant friction whilst the hammock is in use will quickly cause wear and reduce the life of the hammock significantly. Always attach rope to the hammock handles using the standard hammock knot, shown here and on the hanging tips page, and take the rope upto the fixing point. This eliminates wear on the hammock handles and allows you to adjust the overall height. Also remember that all things have a limited lifespan. It is important to check that the rope being used has not deteriorated over time. When hanging your hammock for the first time you should leave it unopened and gently bounce on it a few times to take up any slack in the weave. After bouncing for a minute or two, one person should lie in the hammock initially and stretch out. If you do not do this there is a chance that the hammock will develop a bulge in the centre that will be difficult to shake out. This bouncing also tests the fixings prior to use. Sharp objects, buckles and buttons can damage your hammock. It's a good idea to remove any articles that might catch the thread before getting in and to check that you're not caught up anywhere before you get out. Take care when handling with watches, rings, hairgrips and bracelets. 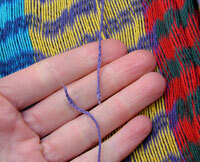 If you accidently pull a thread just ease it back into the weave, shaking the hammock to even everything out. 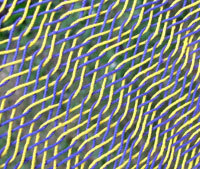 To mend a broken thread just pull out the two broken ends a little and weave them back in using the surrounding weave as a guide. The broken thread should run over two threads, under two threads, then turn back over two and under two again. Using this simple system a break can be fixed quickly and finished off with a simple reef knot. Where two or more threads have been broken you might find it easier to attach clothes pegs to the thread ends whilst weaving them back into the body. 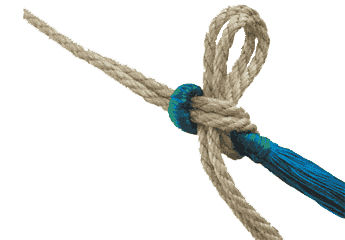 Use loose knots to join the ends initially. When you are sure that the weave is correct, finalise with good tight reef knots. Tie each arm at equal intervals with pieces of cord and leave to soak in tepid water with shampoo and a handfull of salt. With the arms tied in this fashion there is less risk of tangled strings. Take care to dry the hammock quickly after washing. To do this effectively rehang the hammock and place a stick or broom crosswise in the net to keep it fully extended. This ensures maximum ventilation and helps to dry the thread quickly and thoroughly. Remember never to fold the hammock when wet or store it in a damp place. As with any other cotton item your hammock will not last forever. It will however give a good number of years of service when you take reasonable care as outlined above. Probably most important is to remove any sharp objects and avoid clothes with lots of buttons and zips on the back which can get caught in the net. When you get out it's a good idea to briefly check that nothing is caught in the weave. If you do break a thread just weave the two ends back in and tie a simple knot.